Брачные международные знакомства онлайн. Серьезные женихи и невесты, бесплатная регистрация. MarryMeCity.com. Book for chidlren on healthy food. Each story in an entertaining fairy or folk tale representational form tells about a particular fruit, its importance in daily diet, its values and the book concludes with a set of healthy recipes. 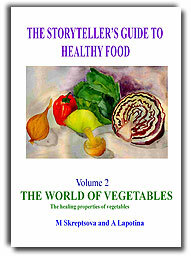 The Storyteller's Guide to Healthy Food Series. 37 stories, tasks and creative games about vegetables. 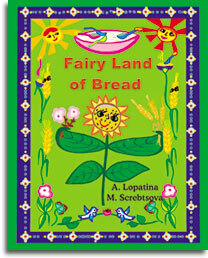 Each story is delivered in an entertaining fairy-tale representational form and tells about a particular vegetable, its importance in daily diet, its values and the book concludes with a healthy recipe. EDUCATIONAL STORIES for children on Healthy Food. Make sure we get enough vitamins. We all know that but how can we get children to eat what's good for them? The answer to that one isn't so hard either: teach them to love fruits, berries and vegetables – the best source of vitamins. But there's no point in telling a child, “Eat this, it's good for your!” We need a special language – the language of stories. The “Storyteller's Guide to Health” series presents the healthy and healing gifts of nature in captivating and warm-hearted tales narrated by children, adults and their friends from the world of fruits, berries, vegetables and grains. Volume Three introduces us to the world of herbs, nuts, honey and grains. A healthy lifestyle includes the ability to draw sensibly on the vitamin-rich treasure our world provides. So often we pass them by… ands pay dearly for our indifference. But it's never too late to change, especially if there's a little one in the family, a child whose life is just beginning. For anyone interested in their child's well-being, “The Storyteller's Guide to Health” series is sure to be of value. At the end of the section of delightful stories, questions and activities you'll also find recipes for the vitamin-conscious kitchen. The recipes are simple, allowing children to prepare dishes themselves with only minimal supervision, and also designed to preserve the largest possible share of vitamins and other nutrients in the final serving. For the first time series of books created by the authors M.Skrebtsova and A.Lopatina are available in the English language and we hope that you will enjoy the series. The first book is The World of Fruits and there are more books to come on Vegetables - Volume 2 and also Grains, Nuts, Honey - Volume 3. We hope that with support of the public and educators, whether school teachers or home-educating families, that all their wonderful books will be made available to the English-speaking world, so obtain your copy of this book on HEALTHY FOOD now and keep coming back to see the rest. Here’s wishing you love and – GOOD HEALTH! - Maria Skrebtsova and Alexandra Lopatina – the authors. 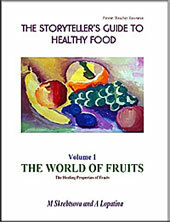 ENTERTAINING AND INFORMATIVE BOOKS ON FRUIT AND VEGS. of fruit and vegs do for your body! The third volume of our book on health will tell you the truthful fairy tales - stories on cereals, honey, grains, porridge, nuts, herbs - these tiny kernels which feed and heal millions of people. In fact, they not only feed, but also clothe and even give protection from bad weather.